All this is very well and good, but we’ve decided to go a little farther. If the SMRT on-train screens are so ineffectual (which we have to prove), then what would be better? What sort of screens are the screens that people really need? Rather than take the usual “from-designer’s-point-of-view” approach into designing the screens, we tried to understand the needs of commuters through user interviews and contextual inquiry. In that way, we can understand the needs of the users and better facilitate in our decision making process. We decided that the best way to start our investigation was with contextual inquiry. This means actually be a commuter, and to see the screens from the commuter’s eyes, in the commuter’s context. Heuristics show what we think. But what do the people think? To find out, we carried out 6 user interviews. As the MRT is a key transport mode for foreign visitors, we made sure to talk to those too. As they know the least about Singapore, the screens should cater more to their needs. We found out two main user needs for the MRT screens: to find out where they are, and to find out how far they are from the destination. While the screens provide this information, users expect this information at a glance. If it’s not available, they will just use their phones, or check the MRT map. Where users are concerned, information like the landmarks is irrelevant to their needs. Surprisingly this is true even of tourists; presumably they already know which station to visit from guides and other sources of information. “NS27 CE2” is typeset in a typeface similar to Calibri, whereas “MARINA BAY” is set in a typeface similar to Arial Thin. Legibility and readability is a concern here. With SMRT setting the type to be all caps and thin typefaces, it makes reading harder to read and is not helped by setting it on a black background or a blurred image of the MRT network map (we know what you did there). The choice of typeface is also open to debate here — considering that LTA have invested in creating their own LTA identity font and used Oceans Sans as their official typeface, it is a little disturbing here when SMRT decided to use a typeface similar to Arial Thin and Calibri as their typeface of choice here. People hardly use the network maps on the screens. Those who do are often surprised by the sudden transition from maps to other information. Most commuters end up looking at the printed maps in the train to count their stops. The screens show landmarks around the station, but it is unclear how they actually help the commuters. We can think of two possible purposes but both have problems. If the landmarks are to introduce the area around the station for tourists, they don’t seem particularly relevant. Government buildings and office towers are unlikely to be much use for a foreign visitor. If the landmarks are a navigation aid, they are of limited use in underground stations. This is because there is no reference (what is the building called on the signage?) and no link between the landmark images and the subsequent guide to station exits. Bigger dots than station names, bigger building names than showing the building itself. Animations can make the information screens more interesting and more attractive, but can be detrimental in a moving train, especially for people with motion sickness. As the next station information is set in a horizontal manner, there are space constrains to squeeze in five stations’ information side by side. Users actually need to know the station name, but the station ‘circles’ are bigger than the text. Also, even with the terminal station coming up, there are still green circles showing upcoming stations circles without any station name. Most locals don’t really look at the screens for station information; they believe the screens are more for tourists. We noticed that commuters do look at the screens but did not notice the “Doors Opening” information — which is separate from the digital screens. The constant animation from the digital screens also draw attention away from the “Doors Opening” information. Most commuters would walk to the wrong side, and switch sides when they reach the platform. Try finding out how to get out Somerset station. The screens showed a highly detailed blueprint of the station, but the screen time is just a few seconds. Commuters therefore cannot interpret the image in time, and most do not try at all. The map’s visual design also leaves something to be desired. The station exits are marked out, but are very difficult to see from a distance. From our observations, most commuters rely on announcements and not the digital board to find out their current location. Only show essential information: We want users to get the information they need immediately. They should not have to evaluate if the information shown is relevant or wait for multiple screens to flash before they get the information they want. Simplify information: We want to reduce the cognitive load on users processing information. Users only need a simple abstract representation of the train platform to know where the escalators are. Having detailed maps that they have process is of little value to them. Productive animations and screen transitions: Animations and screen transitions must not distract the user. If they are included in the screens, they must have a purpose and tell the user useful information. 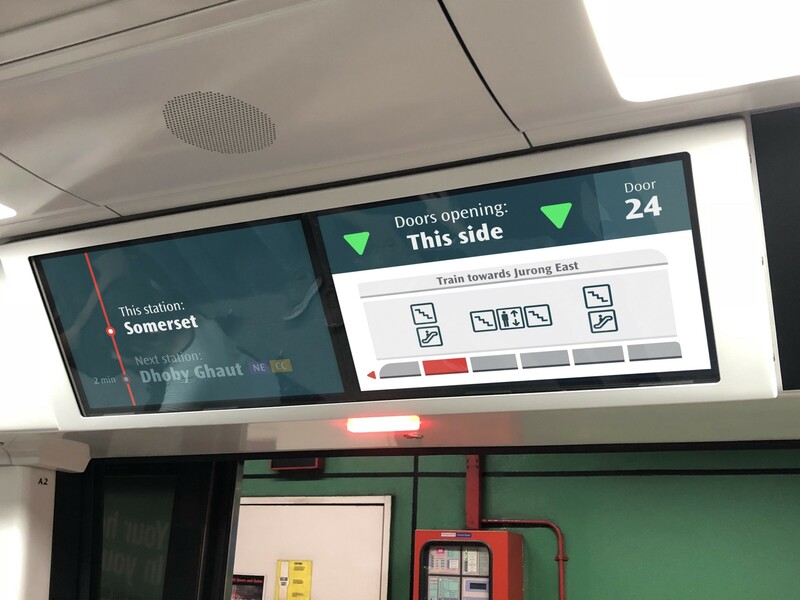 Beautify the screens with SMRT colors and fonts: The layout of the screens must look good and be consistent with the other signs and LCD screens of SMRT. If not, they look out of place and makes the user focus on how ugly or strange they look, instead of the being useful. Where the exits are at Somerset. 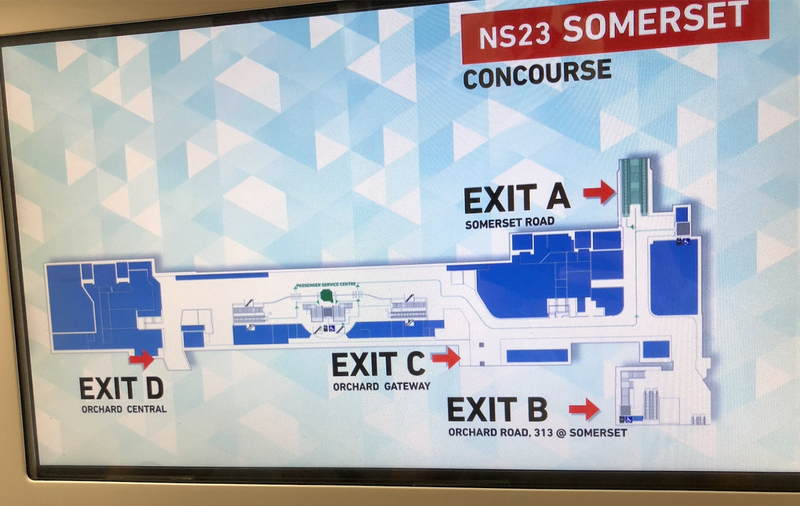 Heading out of Somerset, the display changes to show Dhoby Ghaut’s information, and to give an overview of upcoming stations and the terminus of the line. Screen when the train is at Marina Bay Station. Screen when the train is approaching the last station, as well as when there are train disruptions. Besides being clear about the end of the line, the screens also give another crucial piece of information for users: disruptions or slowdowns across the system. With ample warning, users can reroute if necessary. How the screen might look in the train. Train information screen from Somerset Station to Dhoby Ghaut Station. Train information screen, showing last station and train disruption information, from Marina Bay Station to Marina South Pier Station. Like this? We’d love to talk to you and work with you. You can take a look at our portfolio and the services we provide, and get in touch with us on Facebook, LinkedIn or our website.